We never seem to outgrow our love of playing with clay. The sixth grade made bunnies with white air dry clay. They added pink noses and some of them added hats and orange carrots. A small amount of craft paint kneaded into a ball of the clay gave us the colored clay. We dotted the eyes with a black permanent marker. A project on Disney was the basis for our project, but we encouraged the students to make changes so their bunny would be unique. This project, “Air Dry Clay Bunny,” is found in the 6th Grade Projects Gallery in the sidebar. 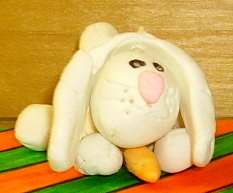 This entry was posted in 6th Grade, Easter and tagged 6th grade, air dry clay, air dry clay bunny, air dry clay craft, bunny clay project, clay craft, easter crafts for kids, easter projects, for kids. Bookmark the permalink.